This is a photo of 4 people – I hope you can see them as you read this. Three out of four of these folks in the picture just so happened to have appointments in my Monday AM clinic. I’ve been taking care of kidney transplant patients for thirty years, but by the end of clinic, I was astounded by seeing how much this meant for each one of them and the different reasons why. As this morning went on I heard this story from three of the four points of view. It very much took me by surprise how much had changed for all four.… It was just another day in the office, but this story is striking and they all wanted to share it with everyone in hopes more people can receive transplants. THE STORIES: First with hat on backwards is DC my patient. A naturally shy and private person. Happiest I’ve seen him in three years but has had many disappointments. It has been an emotional roller coaster, as three years ago he thought he was passing a kidney stone- only to learn he had an advanced kidney disorder and soon wouldeither need to get a transplant or start on dialysis. There had been lots of struggles to get to the point of transplant…. one by one, donors came forward but were disqualified due to minor health issues. Finally one did get through testing and qualify to donate, only to find out she was not a match. He was devastated again. After working with our program, we were poised for a paired donor exchange but with time running out…we needed a non-directed donor to step forward. If someone could donate for DC, his donor would give a kidney for the next person on our waiting list and he would not have to start the process of dialysis. Next to DC’s left is Steve, healthy tugboat pilot who commutes to his home inland and on the way listens to lots of podcasts. Freakonomics Radio had one about Al Roth, a Nobel prize winning economist at Stanford who researches how to create markets for things that don’t have a price. He was the economist who worked to redesign the resident matching program to accommodate couples in the 1990’s and was fascinated by the challenge of how to allocate kidneys from live donors. This is another problem of how to make a market for something that could not be exchanged for cash. He and colleagues designed the system and did the math. And won the Nobel prize! Steve caught on to a few facts in the story – like the hugenumber of potential living donors in this country, and the benefit that could be afforded to those waiting for a kidney from a deceased donor. The fact that the number of such paired donor exchange transplants has grown from only 2 in 2000 to 1000 in 2018, and said sign me up. His generosity and courage started this chain of events. Al Roth’s work is changing the way we are doing kidney transplants at my hospital and bringing in more and more living donors together with recipients they don’t know. The process was hugely important to Steve and it was icing on the cake that he was able to meet DC after it was done. They all mutually agreed to make the process open rather than confidential which was their personal choice. Next is Debbie from Ukqiagvik Alaska (formally Barrow) – the literal ‘end of the earth’ the northern most point in the USA above the arctic circle in Alaska. 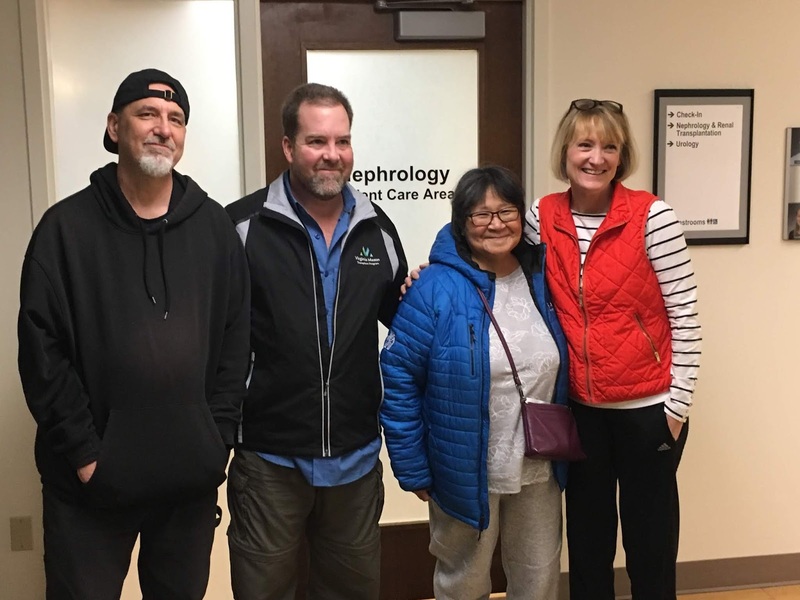 Debbie is an Alaska native whotoughed it out with barely enough renal function for many years but time was running out for her as well. She was at the very top of the waiting list and she was waiting for a deceased donor kidney at our far away transplant center. The logistics of urgent travel to a faraway city fast enough to get a kidney transplant from a deceased donor — while the clock was ticking — made it much more better for her to have a living donor transplant that could be scheduled. As you can tell Debbie has been delighted with her new kidney. She is a long way from home for a few months, but enjoying the challenges of being in the city, even trying foods not part of her diet – like cucumbers (“not my favorite” she says) – not often available above the arctic circle! She is here with family for a few months recovering and adapting to having normal kidney function again. Next is Wendy – Journalist, community organizer and friend of DC. She didgently insist that he let her get tested to donate. He was apprehensive and certainly did not want to ask her. But, as usual, Wendy prevailed. In exchange her kidney went to Debbie who now feels better than she has in years. Wendy is being ‘adopted’ by the women in Ukqiagvik and in clinic that morning, she was wearing the traditional hoodie blouse with big pockets that Debbie’s sisters back home had specially made for Wendy. She is thinking about how to make the trip up north to see her new family of friends. It was Wendy who also gently admonished me for not doing a better job of telling our story to others. She strongly felt that we need to point out that her life and Steve’s are forever changed for the better – – as well as the obvious benefit for DC and Debby. Although this is the kind of work we do every day, we would like to do many more living donor transplants for people and take more people off the waiting lists and out of the dialysis units. There are a lot of moving parts and a lot of people who contribute, but we can scale it up. The more scheduled procedures we do, opposed to deceased donor surgeries which are by necessity emergency surgeries, the greater our impact can be. Each living kidney transplant also frees the deceased donor kidney to go to someone else – in effect doubling the benefit. Thanks to Al Roth, there is now a new market for getting our willing donors together with recipients they do not know. We always respect privacy and our default is to keep this process of ‘entering the market’ safe and anonymous. But, as in this case, the participants can decide to share their experience, meet each other and . . . as Wendy said, “get the word out.” In fact this photo captured the moment after surgery where this group organized a first meeting on their own and went off for lunch. As a kidney transplant physician, I know we have the systems in place to grow this work. Facilitating living kidney donation benefits not only more recipients, but it positively changes lives of these donors. It really positively affects lives of everyone involved. . .even the doctors like me…and I bet even the economists!